By Mateusz Mucha and Filip Derma. 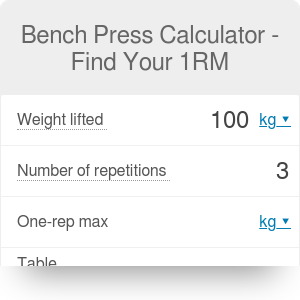 With the bench press calculator, you can find your one rep max. This is defined as the maximum force you're able to produce with a single muscular contraction. This max bench calculator is really a general one rep max calculator and can be used to find the maximum weight you can lift for any movement, such as the squat, shoulder press, or deadlift. In the article below, you can find general information about bench press form, as well as some details about incline bench press and decline bench press.You will also find out how to bench press properly and safely. What is more, we provided data on the world record bench press! Use this 1RM calculator to work even harder towards your strength training goals. Your one rep maximum is the most accurate measure of your strength we have at our disposal, it is used to determine the winner in international powerlifting competitions. Using a bench press calculator is necessary to determine this number because it's difficult to accurately guess the exact weight, taking into account the fatigue you may experience from trying multiple 1RM. Such a method would also not be particularly safe. A safer and more reliable way is to use a 1RM calculator. It is easy to verify, just lift it once! If your goals are focused on muscular strength and fitness level, the max heart rate calculator is a great companion to the bench press calculator. With both together, you'll get a good idea of both your cardiovascular and musculoskeletal strength. To use our 1RM calculator, follow these steps. Pick a weight that is a reasonable challenge for you. After a brief warm up, remembering to stretch, lift that weight as many times as you can. When you reach muscular failure (the point when your working muscle is fully fatigued to the extent that it can no longer complete another repetition of a movement), slowly lower the weight. Type the weight into the calculator, in the box that matches the number of reps you accomplished. Read your one rep max from the top. Note: If using free-weights, you will need a spotter! You'll notice how much easier it is to use the bench press calculator, as opposed to just trying to lift a weight that you suppose is close to your max bench weight. Using a calculator eliminates the guesswork. To calculate the 1RM, you need to divide the number of reps by 30, add 1, and multiply it by the weight you were lifting. This is known as the Epley Formula, the most common formula for 1RM calculation. It is a "submaximal" method of finding your one rep max, as it may under or overestimate your 1RM, due to it only being a prediction. The physical attributes of the athlete can vary massively, so it is impossible to predict based solely on a formula. However, it allows you to find a reasonable starting point, and can therefore help sooth the nerves of less experienced athletes. After reading this paragraph, you will find out how to bench press with a proper form. Always keep in mind your safety! Set the safety pins at the appropriate height - they will catch the weight if you fail to lift it. Moreover, set the connectors to keep the plates in place on the barrel. Follow the tips below to train carefully, safely, and effectively. Setup. Lie on a flat bench and position yourself so your eyes are under the bar. Lift your chest and squeeze your shoulder-blades. Put your feet flat on the floor. Grab the bar. Put your hands on the bar, making sure they are wider than your shoulders. Your little finger should be on the ring marks (on standardized bars, you can find dedicated markers for a gripping place). Hold the bar in the base of your palm with a full grip and straight wrists. Apply force like you want to break the bar down the middle. Unrack. Take a big breath and unrack the bar by straightening your arms. Move the bar over your shoulders with elbows locked. Lower the bar. Lower the barbell to your mid-chest while tucking your elbows in at 75° from your torso. Keep your forearms vertical. Hold your breath at the bottom, making sure not to bounce the bar off of your chest. Once you have finished the planned number of reps rack the weight safely. On the last rep, press the weight away from your chest until you've locked your elbows. Then move the bar horizontally towards the rack, aiming for the dumbbell holders. While above them, bend your elbows to lower the bar in the uprights. Incline bench pressing is a movement that can be used as a preparation for sports like powerlifting, strongman and even Olympic weightlifting. The main benefit in performing incline presses is to develop the upper portion of the pectoral muscles. The pectoralis major muscle is comprised of a clavicular and sternocostal head (upper and lower pectoralis) and incline bench press especially stimulates the upper pecs. When the bench is set at an incline (15-30 degrees), it allows for more shoulders activation than shoulder press itself. Moreover, because of the bench incline, this exercise puts less stress on the rotator cuff, which is a common area of injury while pressing on a flat bench. Incline chest press also has some cons. While flat pressing builds entire pectoral muscles, incline pressing develops only the upper part. Also, it activates deltoid muscles (shoulders) causing serious muscle soreness on the next day. Pain in that place can be really uncomfortable in everyday activities. Set a bench incline at 15-30 degrees. Set the hips and upper back on the bench, keeping your feet strongly rooted on the floor. Grip the barbell - hands should be slightly wider than shoulder-width. Unrack the bar and stabilize it above upper chest (shoulders). Pull the barbel to the chest. Pay attention to keep your chest and shoulders from rounding forward. Press the weight upwards and extend the elbows. Reset, breathe and repeat the desired number of repetitions. If you want to build new muscle mass and strength to your upper torso, you need to get familiar with the decline bench press. The flat bench press seems to be the most popular chest exercise. Actually, it could be the most popular exercise in gyms all over the world. However, it doesn't mean it is the best of all. If you haven't tried the decline version yet, continue reading and try it on your own! Why should you do declines? Good question, but the answer is also good. Many bodybuilding and fitness experts recommend doing this exercise if you want to achieve greater pectoral development. Declines focus on the chest more than pressing on flat or incline bench. In fact, many bodybuilder champions choose decline press instead of the flat bench because of all the shoulder problems that are suspected to be related with doing flat bench so much. The advice for you that comes from their experience is to try it for yourself and find out all the great benefits that come from this exercise. Doing decline bench press, you should definitely think about your safety, especially when you go heavy. Always make sure you have a spotter on standby, in case of a failed press. Moreover, never use a 'false grip', where the thumb is wrapped around with fingers. If the bar slips, the situation will be really dangerous. Absolutely use a regular grip on the bar. Lie flat on a decline bench and set your hands outside of shoulder width. Hook your feet underneath the pad. Pinch your shoulder blades together and drive them into the bench. Take a deep breath and allow your spotter to help you with the lift off. Breathe and allow the bar to descend slowly by unlocking the elbows. Lower the barbell in a straight line, just below your sternum (breastbone) and touch the chest. Push the bar back up in a straight line by pressing yourself into the bench and extending the elbows. Breathe and repeat the sequence for the number of repetitions. 'How much can you bench?' This is the first question people often ask when they meet powerlifters. There is something strange and even mystical about the bench. Chest exercises have always been an important part of physical conditioning, in Graeco-Roman times, soldiers trained push-ups and other weighted exercises. It was not until 1899, when George Hackenschmidt performing what is widely thought to be the first recorded floor press by lifting 164 kg (362 pounds). Over a hundred years later, the exercise had evolved into the bench press. As years passed by and the sport of powerlifting progressed, experts developed advanced trainings and assistive clothing as well. That is why there is a split between 'raw' bench press and 'equipped'. Equipped bench presses are performed in a special shirt made from extremely strong fabric. Due to its elastic energy, it helps the lifter's arms snap upward from the bottom of the lift. It really makes a big difference - powerlifters can achieve results better up to 30%. Take a look below at the world raw powerlifting records. The list is based on Powerlifting Watch data, and it contains best results in open, drug-tested, female, masters 50-59 and masters+ categories. If your goals are focused on improving your general body composition and not just strength, you might also want to use our BMI calculator, and lean body mass calculator. Your BMI estimates whether you are underweight, overweight, or within the normal range. Your lean body mass is everything in your body minus the fat, which can be very useful for body composition goals. Mateusz Mucha and Filip Derma. Bench Press Calculator - Find Your 1RM can be embedded on your website to enrich the content you wrote and make it easier for your visitors to understand your message.